This WCRI report provides early evidence of the effect of the 2013 reforms on total costs per claim, indemnity benefits per claim, and attorney involvement. In 2013, Tennessee Senate Bill (SB) 200 introduced significant changes to the state’s workers’ compensation system, which impacted key cost components. 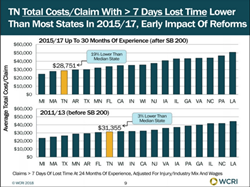 The average total cost per workers’ compensation claim in Tennessee decreased 6 percent in 2015, reflecting in part the impact of reforms enacted in 2013, according to a recent Workers Compensation Research Institute (WCRI) study. For more information about this study or to purchase a copy, visit https://www.wcrinet.org/reports/compscope-benchmarks-for-tennessee-18th-edition. WCRI is recognized as a leader in providing high-quality, objective information about public policy issues involving workers’ compensation systems.